U.S. retailers who sell lighting products can use the information below to help their customers better understand energy-efficient lighting choices. New information will be added as it becomes available. U.S. retailers are welcome to use parts of these materials in their retail displays. In those cases, please do so without the Department of Energy's name, since we will not be approving your version. If you would prefer a different version that fits your requirements for size or layout better, and you'd like to keep the Department's name, you are welcome to submit that revised layout for approval. Native artwork files can be made available upon request. Please also see Information for Media for additional imagery available to retailers, utilities, and others. Download high-resolution image: PDF or EPS. 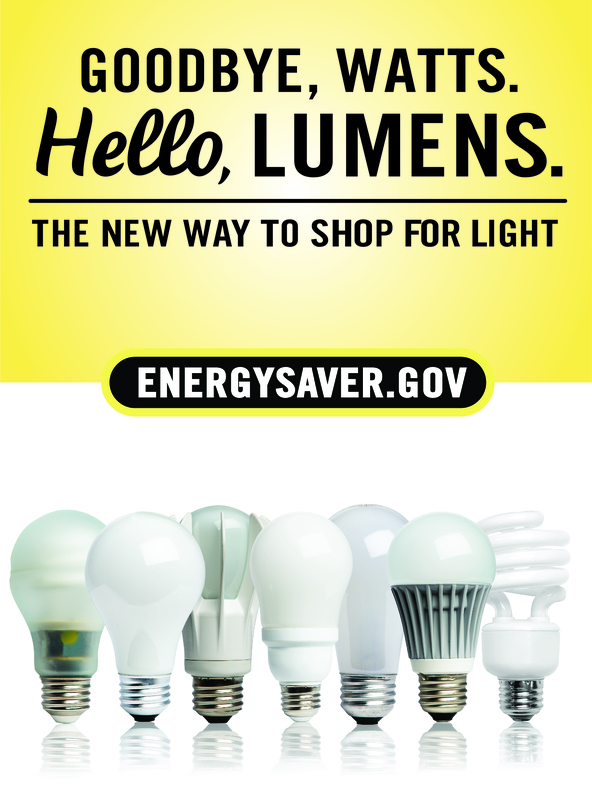 This placard shows how the U.S. Department of Energy is helping consumers to understand lumens, and the shift to lumens from traditional incandescent watts as the common measure of lightbulb "brightness." Download high resolution image: PDF. This tip card provides the money savings from new lighting choices as well as information on lumens and the lighting facts label. This presentation provides helpful background information on the new legislation and the types of energy-efficient lighting available today. Download it here. All of these lightbulbs -- CFLs, LEDs, and energy-saving incandescents -- meet the new energy standards that take effect from 2012–2014. Download high-resolution image: JPG or EPS. Information on the new Lighting Facts label is available on the Federal Trade Commission website. Federal incentives are not currently available for residential lighting products. Find state or local incentives.